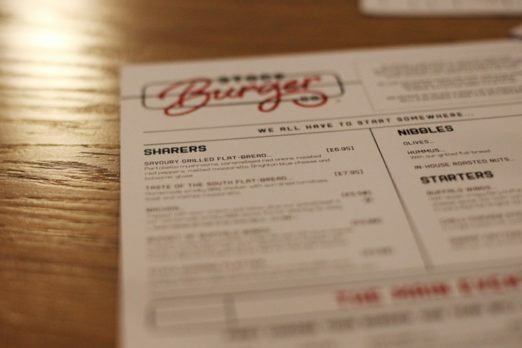 “Brighton is not short of a good burger,” says Stock Burger’s website cheerfully as we log on to check out the menu ahead of time. They’re not wrong there and it takes a brave soul to open another burger joint (or indeed any restaurant) in the crowded, spoilt-for-great-dining-choices scene that is Brighton. Stock Burger claims it has a new take on the burger because our great city didn’t “have quite the place” they were looking for. This new take is ‘burger + beer’. Let’s wait until we’ve eaten, shall we? Scepticism aside it is pleasing to head somewhere with a sea view and we took a pew in one of the oversized window booths. The décor is part diner, part Scandi-inspired and we rather liked it. There is a very slight air of hotel restaurant about it (it’s attached to Holiday Inn and you can see the reception from many tables) but not enough to put you off. As you’d expect the menu focuses on American and Mexican options – think ribs, nachos and chicken wings plus a huge array of burgers. You can select one of the chef’s concoctions or choose from 18 ingredients to build your own. There’s the obligatory eating challenge too, the ‘Hub Cap Burger’ which our waitress assured us isn’t for the faint of heart. Not fancying ourselves as Man v. Food contestants we opted for a range of slightly more modest dishes from the main menu. First up: half rack of pork ribs. These were hard to fault. Tender, juicy and smothered in sweet, sticky BBQ sauce. They reminded of us authentic American ribs we’d eaten in Chicago recently. De-lish. Another selection was the pulled beef brisket with extra pulled beef (yes really) and this was, by all accounts, well flavoured and on the right side of naughty burger indulgence. From there on in, our choices got progressively more average. The naked burger arrived and was perfectly fine, a chicken breast sat atop a giant lettuce leaf with salad. Tasty but unfortunately the waitress forgot the ‘no sauce’ request (one of us was avoiding sugar) and the chicken arrived covered in a marie-rose type dressing that was far too sweet. Nothing bad about it but equally not much to write home about. The Stock Burger, their house creation was ordered by two people on our table with mixed reviews from both. One said it was good, again nothing groundbreaking but a decent burger while the other found gristle in hers and it came out a little cold. 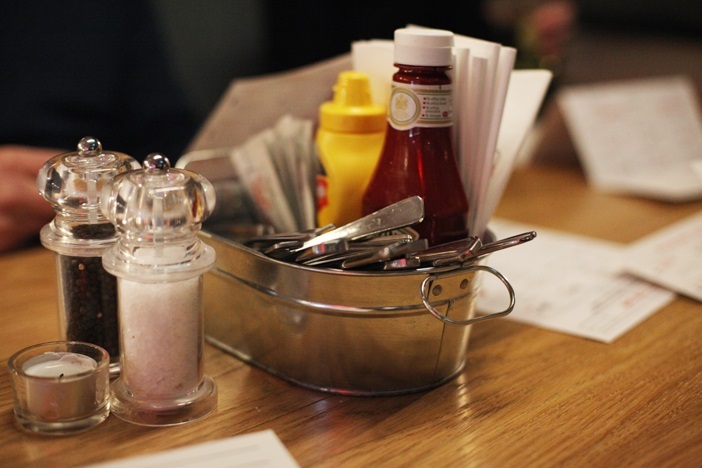 We had no check-back from the waitress to see how we were getting on which, we realised, can often be a little annoying when you’re in the midst of enjoying your food sans interruption but if there’s something awry it’s a good time to let them know. They also didn’t ask how we wanted our beef cooked which seemed a little odd. In short, it was a mixed bag. 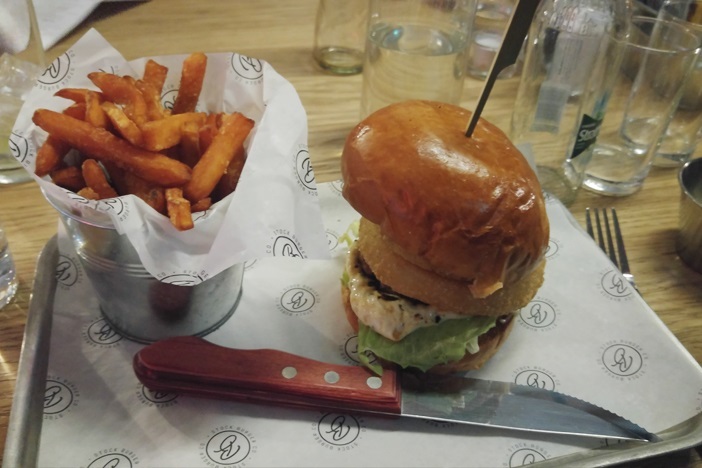 The décor and the interesting menu gave us high hopes, and some dishes really lived up to expectations but their burgers didn’t blow us away. The bill came to over £20 a head without dessert and not everyone was drinking alcohol so the main meal really needed to pack a punch. 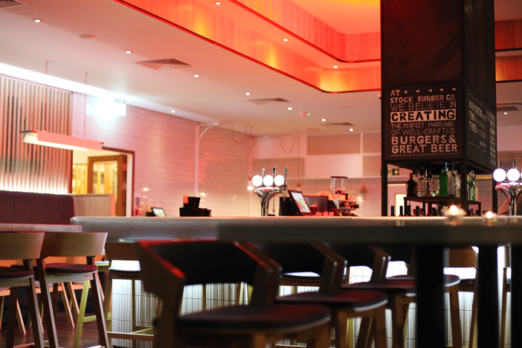 It’s now been open for seven months and if we were struggling for a meal option on the seafront (which is strangely the case more often than not) then we’d head back, but not before we’d tried The New Club first.